TEQUILA.net - In an ongoing demonstration of its commitment to the 10 generation-strong company and family motto – ancestry, prestige and tradition – Jose Cuervo International, the world’s leading Tequila company, today unveils the 2010 edition of Reserva de la Familia. This year the limited-edition handcrafted wooden box for the 15th installment to this collection is adorned with the artistic styling of Pablo Vargas Lugo. 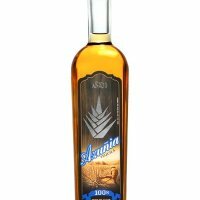 Reserva de la Familia is an award-winning Extra Añejo (aged) Tequila made from hand-selected, 100% pure blue agave grown in the Cuervo estate’s richest volcanic soils. Reserva de la Familia, a crown jewel of the Jose Cuervo portfolio, is considered to be a collectable masterpiece by spirit connoisseurs around the world for both its superior taste and uniquely designed packaging. Each year since 1995, the Cuervo family has selected a renowned Mexican artist to paint the new handcrafted wooden box for its ultra-premium vintage Tequila – part of its continuing support for promising Mexican artists and local culture. This year’s edition features the artistry of Pablo Vargas Lugo, whose work has been featured in more than a hundred exhibitions around the world. Vargas Lugo’s art is not limited to any specific style, technique or theme, but rather he creates works characterized by an apparent simplicity of form, which hides a web of visual and conceptual operations. His works achieve both graphic and three-dimensional qualities by combining industrial and handmade processes. Through this technique, he is able to mix together references and shapes from different sources and times. In addition to winning several awards and a double gold medal from the 2006 San Francisco World Spirits Competition, Reserva de la Familia is recognized by industry experts as one of the world’s finest spirits. Only a limited number of Reserva de la Familia bottles are produced each year, which makes this prized sipping Tequila a much-desired spirit. This exclusive Tequila is part of a private family tradition dating back to 1795, when the Jose Cuervo family would descend into their private cellar to share the finest Tequila reserves with a select group of family and friends. In 1995, to celebrate the 200-year anniversary of the Cuervo brand, the family decided to share Reserva de la Familia with the rest of the world, and began issuing limited-edition bottles. Aged in new French and American charred oak barrels, Reserva de la Familia has a full, mellow taste that combines floral, agave, vanilla, nut and Cognac-like flavors and is typically sipped in a brandy snifter either straight or on the rocks. Each bottle is carefully assembled by hand, numbered and dated, hand-dipped in wax and then placed in the handcrafted wooden box. The 2008 Reserva de la Familia is expected to be available in most U.S. states in March for approximately $100 per 750ml bottle (price varies per market). When enjoying Reserva de la Familia or any other product in the Jose Cuervo portfolio, please do so responsibly. Jose Cuervo is the largest producer of tequila throughout Mexico and around the world. The Jose Cuervo portfolio of tequilas includes Jose Cuervo Especial Gold, the number one tequila worldwide, Jose Cuervo Especial Silver, Jose Cuervo Black Medallion, Jose Cuervo Tradicional, Jose Cuervo Platino, Jose Cuervo Reserva de la Familia, Jose Cuervo Golden Margaritas, Authentic Jose Cuervo Margaritas and Jose Cuervo Margarita Mix. For more information, visit www.josecuervo.com. Jose Cuervo Tequilas are imported and marketed in the United States by Diageo North America, a subsidiary of Diageo plc. Diageo (Dee-AH-Gee-O) is the world's leading premium drinks business with an outstanding collection of beverage alcohol brands across spirits, wines and beer categories. These brands include Johnnie Walker, Guinness, Smirnoff, J&B, Baileys, Cuervo, Tanqueray, Captain Morgan, Crown Royal, Beaulieu Vineyard and Sterling Vineyards wines. Diageo is a global company, trading in more than 180 countries around the world. The company is listed on both the New York Stock Exchange (DEO) and the London Stock Exchange (DGE). For more information about Diageo, its people, brands and performance, visit us at www.diageo.com. For our global resource that promotes responsible drinking through the sharing of best practice tools, information and initiatives, visit DRINKiQ.com. When enjoying its products, Diageo reminds its adult consumers to drink responsibly. As the world's largest spirits, wine and beer company, Diageo is committed to social responsibility and the responsible marketing of its brands. The Diageo Marketing Code is one of the most stringent in the industry. Diageo is a founding member and major supporter of The Century Council, a not-for-profit organization whose programs are designed to combat drunk driving and underage drinking. Celebrating life, every day, everywhere, responsibly.